The entry level Retransfer Printer XID8100 is the perfect solution for the regular day-to-day demand to personalize of all kind of ID Cards. Due to the retransfer printing technology, the printer can print over-the-edge without any limitations to the card design and graphic layout. The proven modular concept enables the printer to follow upgrade demands at any time. As a standard, the printer is coming in a single side version, which can be upgraded with various options. To connect the printer to a PC the USB and Ethernet interfaces are available as a standard. All necessary information about the printer and its status are shown on the LCD display and the settings can be altered using the 4 push buttons right below the LCD display. The print engine is based on a metal frame chassis, hence it is a very solid and precise printing module. The compact and attractive design make the printer fit into any office environment and offers an outstanding price / value performance. 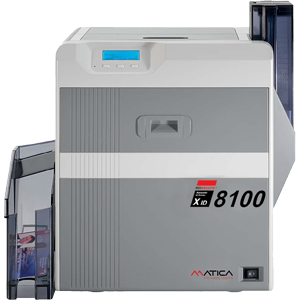 As all retransfer printers from Matica Technologies, the XID8100 comes with a life time warranty for the print head when using the proper consumables from Matica. The XID8100 is working with the new SRT ribbon and retransfer film only.